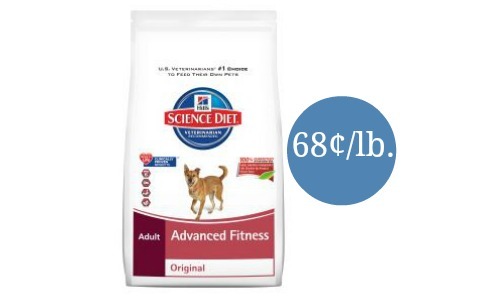 If you need dog food in bulk, there’s a Petsmart deal where you can get Hill’s Science Diet Advanced Fitness Adult Dog Food for as low as $52.98 when you buy (2) bags. That’s 68¢ per lb! Petsmart has two discount deals where you’ll buy one and get one $15 off and you’ll also get $10 off of $60 purchase. Please note that this deal only works on select dog foods. They are out of stock online, but you can get pick your dog food up for FREE in the store. Makes it $52.98, like getting it for 68¢ per lb. This deal is valid through 4/12.